She may be possessed of a small stature, but Jamaican dancer Shelley-Ann Maxwell is all about big dreams. The latest among her amazing accomplishments is landing a place in the company of Fela!, the vibrant, acclaimed Tony-winning Broadway musical that opens later this year at the National Theatre in the UK, where Maxwell has been residing for the past four years. In an exclusive interview, Maxwell tells TALLAWAH about enjoying the moment, looking ahead and challenging herself creatively. Is it at all intimidating to find yourself among the cast/chorus of a theatrical triumph as grand as FELA!? I can't say that I find the prospect intimidating. I think instead I am simply excited at the idea of working with such a dance legend as Bill T. Jones and I’m honoured to have been chosen to embody the vision behind the production that is Fela! What are you most looking forward to when FELA! gets going in the UK? To be a performer on the stage of the Olivier Theatre at the prestigious National Theatre is going to be a great honour, and when I think of being on that stage, moving and singing in a production like FELA!, I get goosebumps. How have you been finding your experiences in the arts abroad? Are you also studying and teaching? I have been living in London for four years now, and so far I can say that the experience has been wholly positive and artistically fulfilling. Since my arrival, I have not stopped going and the work has been forthcoming. One could view it as good fortune, but I like to believe that all the hard labour and preparations of my past have enabled me to continuously gain performance employment here in London. 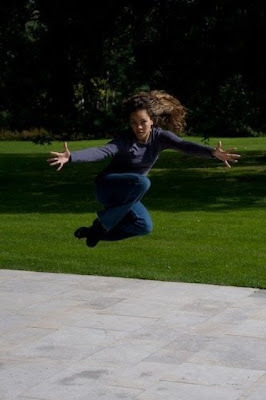 I completed my Masters degree in 2007 and immediately went on to perform for a year with the Tavaziva Dance Company (a London-based contemporary dance company). From there I joined the cast of The Lion King, where I served as a dancer swing for two years. I do believe that the purpose of being an artist is to explore, to challenge oneself, and to do this one needs to have various experiences, experiences through which our knowledge base can be developed. It is for that reason that I decided it was time to leave The Lion King in pursuit of something new, and fortuitously along came Fela! What lessons are you most grateful for at this stage of your life and artistic career? Knowing one's self-worth is very important, and thankfully I am at that point of knowing exactly what I can offer and what perhaps I cannot. This knowledge makes me confident in auditions and less devastated if I don't get the job. I understand now that 'No' doesn't necessarily mean ‘You're no good’. It simply means that in that instance you don't fit the bill of what they're looking for. Life can be hard and brutal in an artistic world ruled by opinions and preferences, but knowing one's worth makes a world of difference between pushing forward and giving up. Earlier this year, we lost the legendary Rex Nettleford. What are your fondest memories of him, and what did you learn from working with him? To think of Professor always makes me feel calm and warm inside. I miss him. To think of Prof immediately brings to mind the resonant sounds that he made with his vocals. He could sound out the feeling behind a movement, the rhythm of it. If you closed your eyes and listened to his “yaa kang ka” you could envision exactly what he wanted. I loved that! He demanded100% all the time, and that's what I try to give to this day. Speaking of Nettleford, will we ever see you back on stage locally performing with the NDTC? That's a definite yes! I've been dying to come back and perform with the company as well as create new work on them too. So definitely keep an eye out for me for the future (Laughs). How do you hope the next chapter of your life and career unfolds? It's an interesting question and an interesting word, the word hope. We will always hope that everything goes well, but for now I have adapted the belief that my path is being lit by the universe, and if I follow the signs, it will lead me to where I hope to be. And for me that is running my own dance company and creating art through dance. So as far as next chapters go, I can only hope that it sees me still using my talents and being given even greater opportunities to explore them. LOSS AND LONGING: Marguerite Newland, Brian Heap, Carol-Ann Menou and Jean-Paul Menou in Andre’s Mother. There’s a moment at the end of Terrence McNally’s remarkable 10-minute work Andre’s Mother when Marguerite Newland (in the title role) clutches a balloon tightly to her chest, an unmistakable look of profound grief etched on her face. After several seconds, she reluctantly releases the balloon and watches as it slowly ascends above her head. The lights slowly go dim on stage, and the audience, previously held spellbound, erupts into rapturous applause. Playing an ostensibly disapproving mother who loses her gay son to AIDS, Newland gave (and without uttering a single word of dialogue), arguably the most moving performance of the night – a fully delectable turn – at Theatre on the Edge 2010. So while there was nothing dramatically new at Theatre on the Edge (in its second year), what the large turnout got was mainly seamlessly chic, occasionally playful and an unmistakably entertaining good time, that we all left the Philip Sherlock Centre Tuesday night with a swoon of gratitude. Featuring eight ten-minute plays, the Kingston On The Edge Event (KOTE) spotlighted a cluster of comedic and dramatic works (some original) centred on love, complex family relationships and gay culture – delivered predominantly with refined language, splashes of novelty and emotional generosity. BROTHERLY LOVE: Dane Richardson and Shayne Powell in Before It Hits Home. Is This (Gay) Love that I’m Feeling? Early highlights included the tender and sinuous Before It Hits Home, penned by Cheryl West and directed by Fabian Thomas, about a bisexual named Wendell (an impressive, controlled Dane Richardson) grappling with decisions and the expectations of his mother, his very animated woman Simone (a delicious Nyanda Cammock) and secret gay lover Douglas (Shayne Powell, who dazzled in Karl Williams’ 2009 offering Random). 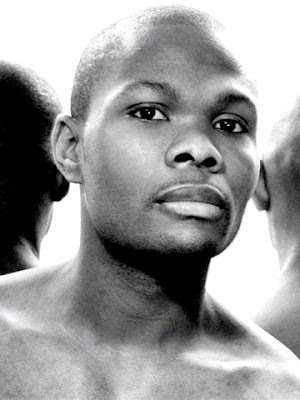 The play moves like a scenario plucked from a juicy E. Lynn Harris novel, but just when I thought the piece would steer clear of gay culture stereotypes, Wendell informs that he has contracted HIV. Sigh. Still, Before It Hits Home is an emotive, if frequently melodramatic, tale that alternates between poignant drama and stirring comedy. Meanwhile, hovering somewhere between luxurious sad tale and delightful character study, Andre’s Mother (directed by Jean-Paul Menou) is a breathlessly arresting and touching look at loss, longing and grief. Menou, in his finest performance, stars as Cal, a gay man who recently lost his beloved (Andre) to…. AIDS. (Is it impossible for modern writers to dispose of gay men in their works with anything other HIV/AIDS?). When the play opens, Cal and his aging father (an engaging Brian Heap), sister Penny (Carol-Ann Menou) and Andre’s mother (Newland) are gathered outdoors, about to release balloons in memory of the deceased even as they reminisce on his life. The performances are noteworthy, but it’s the fabulous writing and atmosphere that truly give Andre’s Mother its clout. In the same vein, emerging writer-director Teneile Warren, one to watch, scores a home run with Dysfunction – A Family Farce, about a “Normal” family that is anything but. One evening over dinner, Penelope (Noelle Kerr) nervously drops the news to her adoptive parents (Albert Williams and Carla Moore) and distracted brother (Andre Robinson) that she liiiiikes girls. But it’s Penelope who is in for a real surprise when the parents reveal their ‘true’ selves as well. It’s an outrageously witty and zesty piece, fuelled by Warren’s indisputable outside-the-box creativity, which rightfully questions what is “normal” anymore. FAMILY AFFAIR: Albert Williams, Andre Robinson, Noelle Kerr and Carla Moore in Teneile Warren’s Dysfunction: A Family Farce. The balance of the night’s offerings featured works that provided breezy challenges for talented leading ladies like Nadia Khan, Rishille Bellamy-Pelicie and Nadean Rawlins. Appearing opposite Melward Morris in the humorous Brian Heap-directed Mangowoman and the Justice League (written by Amba Chevannes), Rawlins dons a superwoman cape for her amusing title turn as a “defender of mangoes, justice and truth” who ends up facing the law for her actions in dealing with an alleged mango thief. In the less successful The Piper’s Return (conceived by Carolyn Allen), Bellamy-Pelicie plays a radio host who sits down for an exclusive on-air interview with a mysterious piper, who is reportedly responsible for the disappearance of several children. Sounds familiar? Khan, meanwhile, dukes it out with Maurice Bryan in Allan Havis’ rollicking and inspired Lilith (nicely helmed by Michael Daley), about a couple on the verge of divorce, stemming from fights over sexual positions in the bedroom. Talk about irreconcilable differences. Keiran King adds a dash of authority to the piece with his stentorian voice-over as the God-like mediator of the deposition proceedings. The technical crew of the Philip Sherlock Centre offered a funny send-up of the sometimes frustrating behind-the-scenes happenings that go into creating a show while The Jamaica Youth Theatre (under the direction of Rayon McLean) gave a sneak peek of their loud and militant new production Graffiti, which will have its grand premiere next month in Manchester, England. 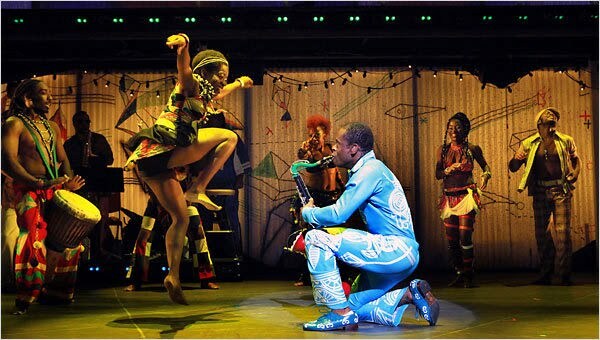 Jamaican-born dancer-choreographer Jermaine Rowe continues his evolution and exploits abroad with a highly coveted spot in the company of FELA!, the multi-Tony Award-winning Broadway show that heads to the National Theatre in London later this year for a fall engagement (starting November 6). 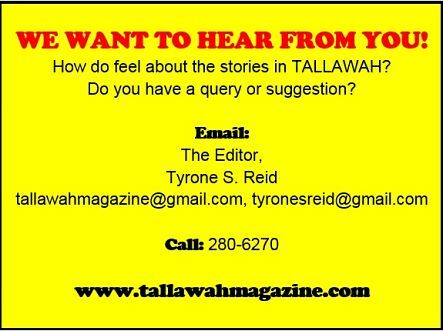 Ever gracious and astonishingly humble, Rowe (one of the two Jamaicans who’ll appear in the show) opens up to TALLAWAH about his growth as an artist, his future and what Rex Nettleford taught him. It’s all about the learning and sharing. I’m very much anticipating working with Bill T. Jones, the choreographer, the Tony-nominated actor Sahr Ngaujah, along with some talented cast members. Also, the experience of working at the National Theatre is something I anxiously await. Is it at all intimidating to find yourself among the cast/chorus of such a huge theatrical triumph? Well, intimidating is a word I rarely use because I approach everything with an openness to learn and grow. I definitely feel honoured and blessed to be given the opportunity to work with Tony Award winners and casts. It’s definitely a great opportunity. And to be a part of the London original cast after its success on Broadway, and also to work at the National Theatre, is one of the goals you set for yourself. And to be actually realizing it is very humbling and exciting. And I will also be taking with me the lessons that I’ve learned from other shows, like the Lion King, and other dance companies. How have you been finding your experiences in the arts in the United States? Well, I’ve learned a very valuable lesson from my experiences so far. It’s hard, but it’s possible. Moving to New York initially as an international student brought its own limitations and stresses. However, what it did for me was open up my eyes to what I thought dance or even theatre was or could be. I saw and experienced an abundance of limitless possibilities and once you learn and find what works for you, and believe in its process and hard work, then you reap the rewards. For me, New York City worked as an artist, and it was a combination of hard work, talent and the right people being placed in your life at the right time. Are you also studying and teaching? 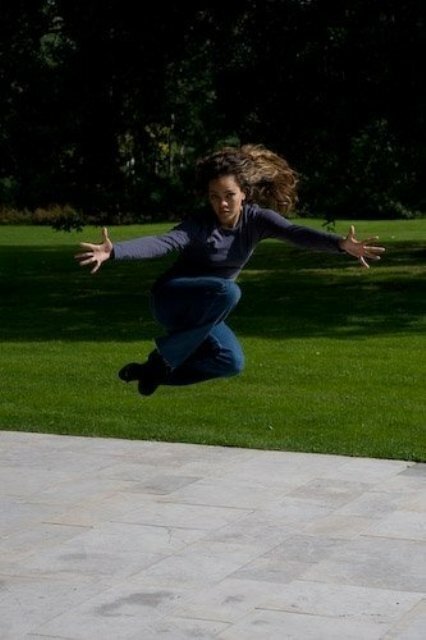 At present I still take open classes daily to maintain and grow, in dance/ballet, voice and acting. I run a Summer arts program in the Bronx for children 5 to 15 at Baychester Community Centre. But when you’re fully involved in a Broadway show, your extra time becomes very limited. Earlier this year, the Caribbean lost the great icon Rex Nettleford. What are your fondest memories of him, and what did you learn from working with him? Well, as I always say to people who ask me, “Prof. was my boy!” He meant so much to me and my development in dance and life. He encouraged me to not be afraid of my complete self, my full potential, academically and artistically. To embrace the things I can learn from those who went before me, and to realize that I also have something to offer. I would always call Professor whenever I had a new and major decision to make; and almost felt cheated not being able to call and share FELA! With him. But as my friend (an NDTC dancer) reminded me, he already gave us those lessons, and we now know how he would react. I have just been very blessed and honoured to have worked personally with him and to say he was my friend. Will we ever see you back on stage locally performing with the NDTC? NDTC is home. It’s a part of that foundation that helped me to be where I am today. The lessons and nuances I’ve learned from NDTC and Jamaica, is why I have been offered jobs all across the world. So definitely I would love to be back performing with NDTC. However time cannot say when. Well, I have many ideas and things I’d like to achieve. However, I’ve learnt that all I can do is continue to do what I do and put in the hard work, so that when the opportunity comes I’ll be ready and not getting ready. So for the next chapter of my life I hope to be doing exactly what I’m doing now: living my passion. Wow, that’s a hard one. Because you learn so much lessons daily. The lesson of sacrifice is one that is foremost. You have to be willing to do without things that you think you need in the immediate and be willing to accept the hard work and believe that it will pay off. Also the lesson of personal acceptance. I started to learn more about myself and become accepting of my quirkiness and flaws and see them as my uniqueness and my gift to share. And that’s a hard lesson, because somebody is always taller, stronger, have more technique, seemingly more ability. But when you learn to accept your gifts as your way of uniquely interpreting the art, then things start falling into place. Mangowoman and the Justice League, starring Nadean Rawlins and Melward Morris. Before It Hits Home, starring Dane Richardson, Nyanda Cammock and Shayne Powell. Lilith, starring Nadia Khan and Maurice Bryan. Graffiti, starring members of the Jamaica Youth Theatre. 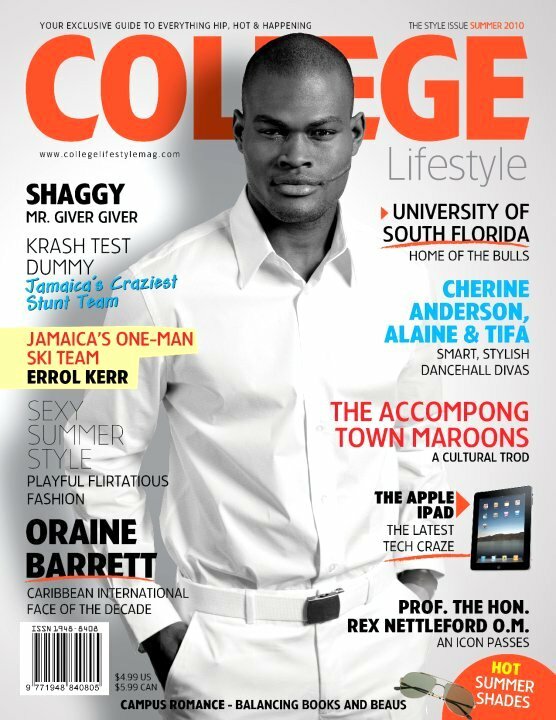 THE FASHIONABLE LIFE: Fresh from his buzzworthy JAMROCK Magazine cover, Pulse supermodel and Ralph Lauren campaign lead Oraine Barrett has nabbed another cover; this time he is gracing the summer 2010 issue of College Lifestyle, which hits newsstands next month. Great cover. The in-demand Barrett recently graced the runway at Caribbean Fashion Week (CFW) and remains busy abroad with back-to-back shoots and shows. White is definitely the colour of summer, and Barrett is seriously rockin’ that white shirt! Love it. ROOTS-ROCKIN’ ABROAD: Great news for the local film industry: the ever-growing Reggae Film Festival has been invited to the Rototom Sunsplash, the biggest reggae festival in Europe, to present a 3-night programme of films during its 2010 event, to be held at Benicassim, Spain from August 21-28. Film festival director Barbara Blake Hannah (above) will also participate in the Rototom Reggae University with an audio-visual presentation on “Rastafari In Film”. Rototom is historically Europe's largest annual tribute to Jamaica's reggae culture. There have been 16 editions of the event, held previously in Italy, but moved this year to a new venue near the beach at Benicassim, Spain. Non-stop music and artists from all over the world recreate the unique atmosphere of original Jamaican music festivals. Daily crowds of 25,000 and overall audiences of 160,000 from more than 100 nations attend the 10-day event, some pitching tents in the well-established camping grounds. CHERINE’S CAUSE: Just as I was about to draft my ‘Where are you, Cherine?” letter, the dancehall-soul vixen pops up on the radar. The fab singer-songwriter will be singing a slightly different tune this weekend. On Saturday (June 26) Anderson will don the hat of team captain to mobilize a passionate and driven group of young ‘dancehall- SOULdiers’ (members of Team Dancehall Soul) to help raise funds for cancer awareness, research and outreach at Jamaica Cancer Society's Relay For Life. With several activities planned, Anderson is excited about the prospects. All proceeds from Anderson’s EP "The Introduction-Dubstyle" sold at the event will go towards the outreach efforts. No stranger to giving back to her community, Cherine started her own Reach-One Child Foundation in 2003 and has been helping need-based students with supplies and partial tuition scholarships. Working with the cancer society is a first for Anderson. In addition, she is aware of the seriousness of cancer as well as its effects on patients and their families. 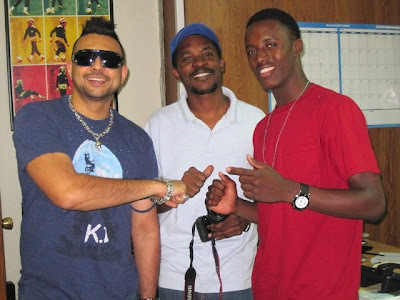 LET’S HEAR IT FOR THE BOYS: Sean Paul (left), fresh from his five-week European trek, and singer Romain Virgo hang with head honcho of Headline Entertainment Jerome Hamilton. Virgo officially launched his self-titled debut album in Kingston on Tuesday. 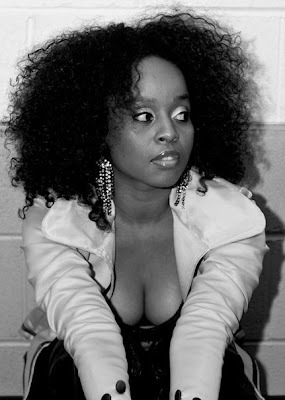 The album, which has received favourable reviews from critics, debuted at number 14 on the Billboard Reggae Album Chart. MODEL BEHAVIOUR: Jaunel McKenzie (second left) joins her catwalk colleagues for the recent ‘Black Out at the Black Room’ party in New York City, which was hosted to celebrate beauty legend Iman receiving the 2010 CFDA Fashion Icon Award. McKenzie was in the island last week to hit the runway for Caribbean Fashion Week (CFW). 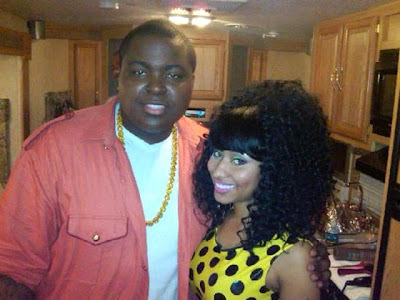 OCHI FLEX: Pop artiste Sean Kingston and rapper Nicki Minaj are all smiles for the lens on the set of their new video for their collab “Letting Go,” which they filmed on the Jamaican North Coast (Ocho Rios) recently. Sean Kingston later tweeted to fans: “Had alot of fun in jamaica!!!! wicked video shoot, it sell off man, cant wait till u all see it man, im excited shouts out to Director "X". 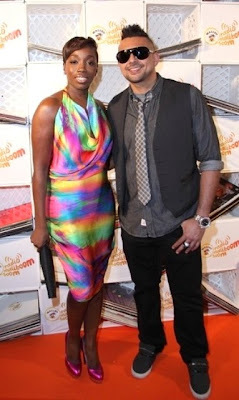 SUMMER SPIRIT: R&B-pop songstress Estelle and dancehall Grammy winner Sean Paul (who collaborated on the hit “Come Over”) celebrate the start of the summer season at a Malibu Run event on the Tribeca Rooftop in New York City recently. Are these two dating? No. I seriously doubt it. But these days you can never tell. 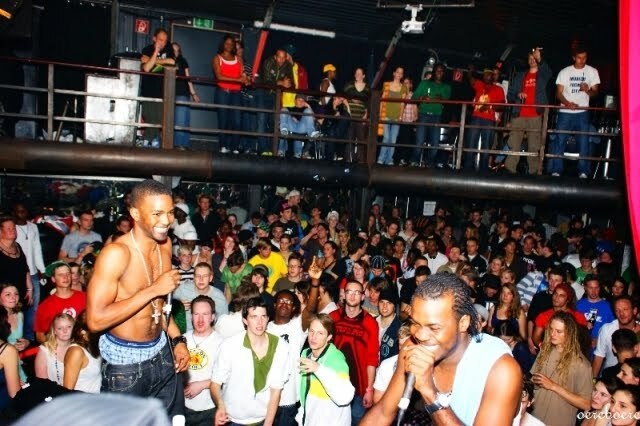 CRAZY CLUB VIBES: Dancehall fire-starter Konshens (left) and his Young Veterans protégé Darrio are currently on a European tour, blazing that real reggae-dancehall fire at clubs and other venues in such cities as Munich. Meanwhile, Konshens recently dropped quite an attention-grabbing vid for “Bounce like a Ball,” and his radio-friendly collabo “Rave Wi Ah Rave” with fellow hotshot Chino is the hottest single in the streets.